If you have been reading this blog for quite some time you should know by now that I am a sucker for a good side hustle. I recently came across an app called Steady that was designed just for that. Steady is a new app for people looking to supplement their income with a variety of part-time, one-time or temporary jobs. Steady was founded in the summer of 2017 by Adam Roseman, Michael Loeb and Eric Aroesty out of their own experience with Roseman’s father who had to take part-time jobs and side hustles to make ends meet. He was then able to find flexible work opportunities that aligned with his own interests and abilities. They wanted to create the Steady app to help other people do the same. 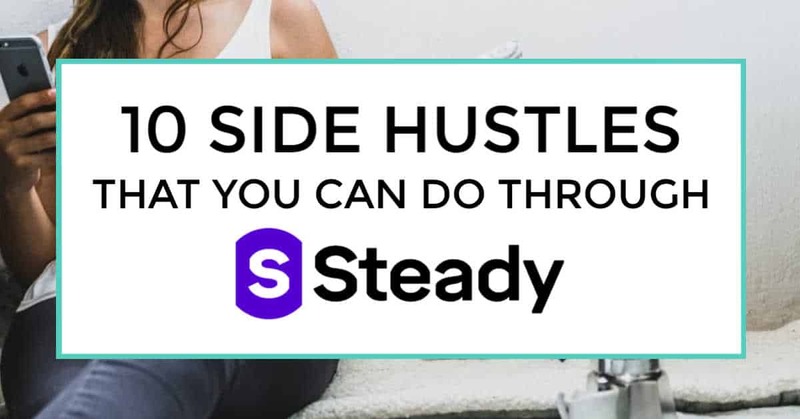 Steady makes it easy for side hustlers to find the best work opportunities out there to help build their careers along with being able to manage their income. The app not only shows you side hustle opportunities nearby and online but it also shows you how to get the most income out of those opportunities. How the app works is by recommending personalized work opportunities for users and help track the income from those opportunities. By using the app, users can learn where there are gaps in their income and help find even more work to fill in those gaps and increase their monthly income. So let’s look at some of the side hustles you can do through the app. After you download the app, you can actually start looking at jobs right away without even having to sign up. After the app is installed and launched on your phone, just enter your zip code to see a preview of some of the jobs available online and in your area. To see all of the opportunities available you have to sign up which is completely free. After signup you will take a short survey so the Steady app can show you the best possible opportunities for you and jobs that you easily match for. This survey consists of basic questions like what is most important to you about the job (getting hired quickly, getting paid quickly, guaranteed hire, etc), what type of work have you had experience in, the days and times you want to work, where you are comfortable working (outside, in another home or corporate office), etc. The initial survey after signup only takes about 5 minutes to complete, if that. After you have completed the survey, Steady will be able to personalize your experience and you are off to the races! Here are some of the jobs and side hustles I found after completing my survey. When you view the list of available jobs, click the ‘View Details’ link on the left hand side of the job listing widget, and you will see the full details of the gig before deciding to apply. When I viewed the details of Care.com I can see that this hustle falls under something I have had experience with, babysitting and caregiving. Families on Care.com have a variety of jobs available to you once you apply including child care, pet care, senior care, housekeeping, and tutoring. Caregivers are matched with families every 3 minutes; you set your own rates, it takes 15 minutes to apply and you must be at least 18 years old. After applying it takes 1-2 days to get approved. 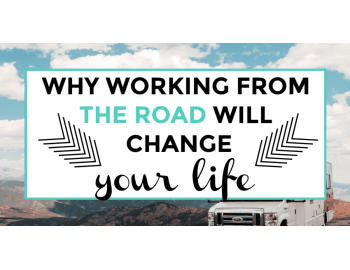 As a Bellhops mover you can make up to $21 an hour and set your own schedule. Movers are in high demand especially during the weekend and a great side hustle to strengthen your body, mind and wallet. It takes 20 minutes to apply to be a Bellhops mover and 1-3 weeks to get approved. You must be able to lift 100 lbs, be at least 18 years old and pass a background check. As a website tester for Whatusersdo, you can make up to $5 per completed website test and help companies improve their websites on a desktop, mobile, and tablets. It takes only 10 minutes to complete the application to become a website tester and 1-3 days to get approved. You must have high speed internet connection and complete a practice test along with a couple of other requirements to get approved. Being a Homeglow home cleaner is a great side hustle as you get paid weekly and set your own rates. You also get to accept only the work you want so you aren’t stuck with some impossible job. You will need to have relevant experience and have to pass a background check before you get approved. Also, you have to take a cleaning quiz during the application process but the quoted time to finish the application is only 10 minutes so it shouldn’t be too hard. This is the perfect side gig for the stay at home parent or someone who really rather stay at home and work. Liveops connects you to available work in customer service as an at-home virtual call center agent. It takes about 30 minutes to complete the application and you will need to pass a background and credit check. TwoSigmas is an online teaching service that will pay you up to $22 an hour to teach English lessons online from home. You will need to have some teaching experience in order to qualify and a bachelor’s degree. This is the perfect side job for a teacher who needs offseason work or someone looking for a convenient at-home gig and loves teaching. Do you love getting involved in politics and important issues? Then a NextWave political outreach representative might be the perfect hustle for you to pursue. You will be doing persuasive writing and telephone outreach for a variety of NextWave projects and get paid $11 an hour to work them from the comfort of your home. You do get to choose the projects you want so you aren’t stuck working projects for political views you don’t necessarily agree with. Are you a licensed massage therapist with your own massage table? Then you should definitely check out Soothe for some extra massage gigs to help supplement your current massage therapist income. You will be paid upon the completion of an appointment and the opportunity to earn three to four times the industry standard. Check out the listing on the app and it only takes about 10 minutes to apply. goPuff is a product delivery service that delivers thousands of convenience items including groceries, household essentials, office supplies, electronics, etc. You can get paid up to $20 an hour as an independently contracted delivery driver. Each day would begin at their warehouse where you will be moving in and out of that location, safely delivering products from the warehouse to the customer. This is one of the most exciting job listings I saw on the app. I have always wanted to try voice acting myself so I think I might actually give this one a try. Voice123 is a service that provides available voice actors for a variety of clients. You can apply to be one of these voice actors through the app and it only takes about 5 minutes to complete the application, no experience necessary! The Steady app as tons of amazing features that make it easy for you to take part in the gig economy without losing your mind. Sometimes multi tasking and working more than one job can be overwhelming. An activity feed so you can see when new gigs are added. An income tracker feature where you can link your bank account and track the extra income you are making through the Steady app. A benefits feature where you can get amazing benefits like 80% off prescriptions, free mileage and expense tracking, Sam’s club membership, and much more. They are also expanding their main tools and features through February 2019. They will be launching an “Activity Feed”, which will be a feed on the app for users create a community, engage, share knowledge, tips, and possible opportunities in their area. 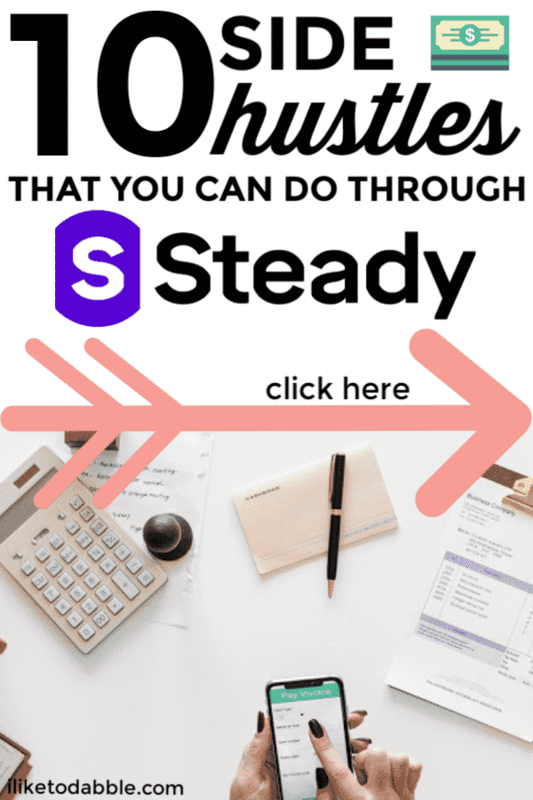 If you are ready to start side hustling through the Steady app, get started here! What other apps and tools have you used for your side hustle? Would you be interested in using an app like the Steady app to find new ways to side hustle?